"It was very important for this project to use U.S.-manufactured products only. Yaskawa - Solectria Solar has been manufacturing their inverters in the U.S. since 2005 and has vast experience delivering successful projects. This experience, their strong balance sheet and responsive service team were extremely important during our decision-making process. We have the utmost confidence in the performance of their inverters," said Bo Balzar, Division Manager at Bombard Renewable Energy.
" Yaskawa - Solectria Solar is proud to be part of this innovative PV system that not only uses all U.S.-made products, but is also built to minimize impact to the endangered tortoises. It proves that manufacturers, EPC, utilities and public agencies can work together on projects that influence various facets of sustainability. Bombard is a great customer and did an excellent job with this design," said Allison Duffy, Sr. Key Account Manager at Yaskawa - Solectria Solar. About Yaskawa - Solectria Solar Yaskawa - Solectria Solar, a wholly-owned subsidiary of Yaskawa America, Inc., is the largest commercial inverter manufacturer in the U.S. Solectria's products include 3.8 to 750 kW inverters, string combiners and web-based monitoring for all size solar systems. Solectria is backed by over 100 years of power electronics and inverter experience. All of Solectria's three-phase central inverters are made in the USA. PV System owners, developers and EPCs rely on the high performance, reliability and bankability of Yaskawa - Solectria Solar. To learn more, please go to www.solectria.com. 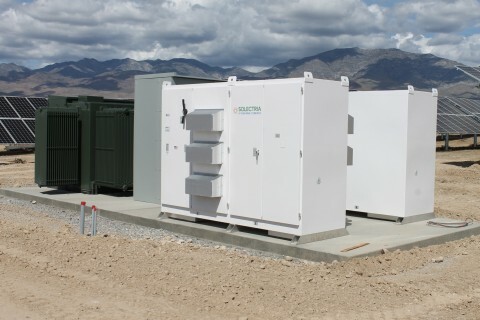 About Bombard Renewable Energy Bombard Renewable Energy, a division of Bombard Electric, LLC, serves commercial, utility, residential and non-profit customers in both the public and private sectors in and around Las Vegas. Bombard Renewable Energy of Las Vegas was recently named No. 47 on Solar Power World's 2015 Top 500 Solar Contractors list. Bombard Electric has been doing business in Nevada since 1982 and is a member of MDU Construction Services Group, Inc., an industry-leading construction services company with locations across the country. MDU Construction Services Group is part of MDU Resources Group, Inc. (NYSE: MDU). For more information, visit www.bombardre.com.